love this Copper Grove Bitter Root Area Rug !It's exactly what I wanted and fits my kitchen area perfect.The texture sweeps off easily when you don't have time to vacuum.The texture of the rug is very nice and feels great on your feet,a perfect country feeling.The picture on the web sight was right on as far as the color and texture size. Terry L.
Made for stain-resistance and a homey look and feel, this Bitterroot rug from Copper Grove will bring rustic lodge style to your cabin. The folksy geometric, patchwork pattern features tones of blue, red, and beige. The machine-woven, polypropylene construction provides durability for use in high-traffic areas, making this warm and welcoming rug the perfect choice for your living room. 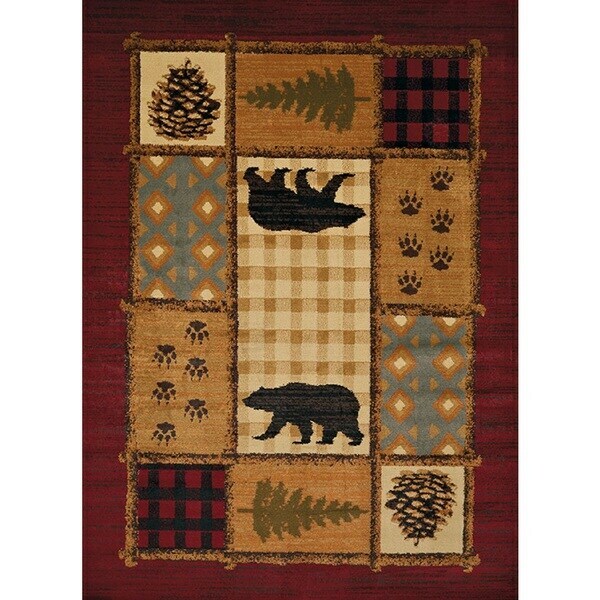 This rug fits perfectly with our cabin theme. Nice quality and colors. The rug is really a good quality, especially for the price. For me, it's a bit more red than it looked in the photo. I expected it to be a bit more maroon as opposed to red. It's fine though. It laid flat practically from the time I unrolled it. Perhaps took a day or two. I'm very pleased but I just wish it was a bit more maroon. If you're looking for red, perhaps this is for you. Good size, but material was thinner then ecpected!